* Follow this link for an up to date reference guide for a description of each event along with the data that is shared for each event. Each log event that corresponds to our archiving project will have a special tag named uid within the metadata block. As described in the previous two blogs, the uid is an application generated field which is generated by your email injection systems during the email send process and placed into the X-MSYS-API header and the email body via a hidden html field. The uid field in the email body will be the only id that survives through all emails and logging events and thus is needed to pull everything together (remember that the inbound event data does not have the UID metadata, that is why we must hide the id in the email body). But all of the event log data in this step will have the UID entry that we need. 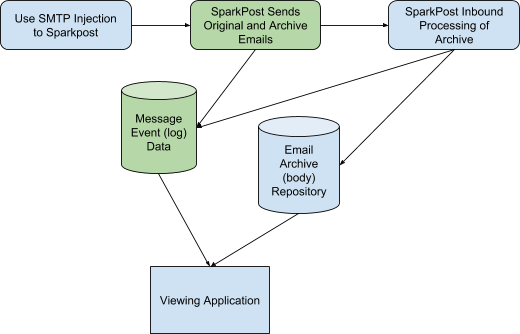 SparkPost webhooks have the ability to allow the user to pick which events they want to be delivered to their endpoint (collector), but they don’t have the ability to filter specific events given specific data. For example, what if you sent welcome emails to your new customers and you only want open events with the subject line of ‘Welcome’ sent to a specific endpoint? Nope, can’t do that. You can filter on the click event, but not on given data within the subject field. That means that our endpoint will get all events of a given type (open, click, bounces, etc) and we need to filter out the data that has nothing to do with our archive process. To filter out the noise, we will search each event for the UID field within the metadata block. If the event has the UID field, then we care about that data; otherwise, we skip that data event (that also means, that the field name that you use for the UID needs to be unique to this project). * Note: SparkPost does have the ability to filter events for subaccounts. To simplify the storing code, you could send all emails that need to be archived through a specific subaccount. That would allow SparkPost to filter out the events for just that subaccount and only send those events to your collector. It won’t save you a lot of code, but this is an option. In this phase of the code, I have an endpoint that captures and stores all events from SparkPost into a directory. That is all the work the endpoint does. This follows the best practice of doing as little work as possible within the endpoint, so it can keep up with how fast SparkPost may be delivering data to that endpoint (this is the retrieveWebhook.php code). Being honest, this is NOT the approach I did with the first phase of the project when I stored the archive body. I do plan on going back to fix that at a later date. The next step will be for a cron job or group of cron jobs that will read the directory of files and start processing them (this is the processOutboundWebHooks.php code). In order to support high volume sending, I expect that this code may have multiple instances running in parallel. So I have the code read the list of files within a directory and try to lock the file it wants to process. If the lock process works, it will proceed; if the lock process doesn’t work, then it’s assumed that another process is working on that file and skips that file and go onto the next one in the list. Once your code has a file, we need to turn the data into an array and start to process each event separately. But remember, we only want the ones with the uid field; that tells use that this data belongs to the archive process and we may want to store that data. In my code, I loop through each event pulling out specific fields that I know I want to store. Also for filtering purposes, there is an important key/value pair that I’m paying special attention to, it’s the rcpt_type key/value pair. When an email is sent out using either the cc, bcc or the archive feature, each event will have a corresponding rcpt_type of either ‘cc’, ‘bcc’ or ‘archive’. My design allows for the email administrator to decide if they want to keep or filter those out by placing the appropriate values in the config file. By setting the $store flag to true; the rest of the program will store the corresponding data for that event. Since the file may have many events; we create an array of each event. Looping through each event, we pull data we are interested in. the rcpt_type and uid are necessary to decide if we care about this event. If we decide to store this event; we proceed with saving the data to our SQL table. In this project, some of the more significant fields that I decided to use for indexing are: campaign_id, subject, timestamp, template_id and of course the rcpt_to field which holds the target email address.
'" . $friendly_from . "', '" . $injection_time . "', '" . $rcpt_to . "', '" . $rcpt_type . "', '" . $subject . " Without dragging this on, that is all we need to review for this portion of the code. As you can see, most of the work was done in the previous steps so all we have to do is retrieve the data, check to make sure it’s data we care about, then log it. The next code drop will have a sample viewer with something similar to an inbox. Until then, it’s up to you to come up with some ways to view the data. If you have something to share, I’m sure everyone will be happy to see your work.